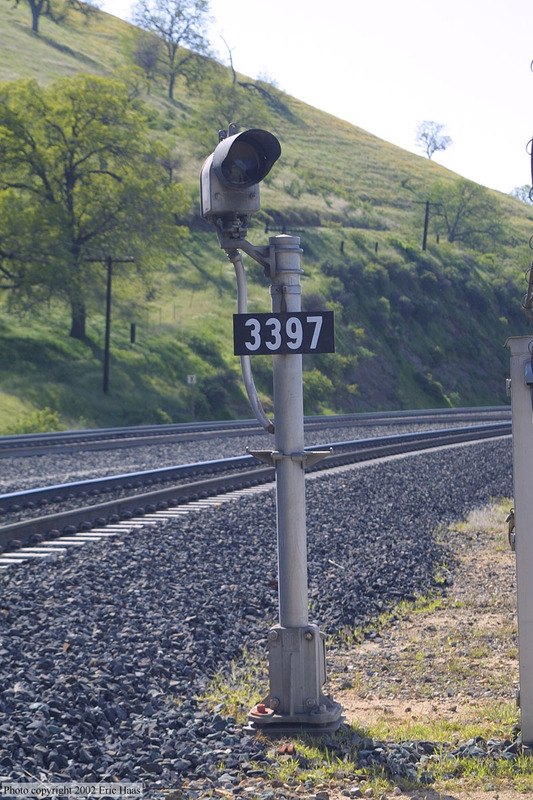 Okay, so over in #ednadolski 's layout thread a bunch of stuff came up about prototype signals on Tehachapi. I am compelled to start a new thread on the subject since that is one of the locations the club I belong to models. Sorry to all of you who might be bored with Tehachapi threads, but I'd love to have #ChrisKLAS and #kc9jts and perhaps #C855B chime in on a bunch of questions that have been raised. And probably Ed and #GaryHinshaw could benefit from the discussion, too. I'm going to post a bunch of questions I have, probably mostly in multiple posts and not all tonight, and we can discuss from there. Heh. I remember those signals (I lived in the area then). Lower head was a fixed green - not an SA, in other words - so if you were lined into Walong (or Woodford), it would be a yellow-over-green. Otherwise, it would be dark. This oddity was needed to avoid the need for abrupt changes in throttle/DB settings in difficult terrain, because normally this intermediate signal would show yellow if the siding signal was red-over-whatever, the yellow (alone) signifying preparation for a probable full stop at the "A" signal controlling the siding entrance. Yellow-over-green was proper in either case, as it was a "distant" aspect corresponding to the indication on the next lower head. So the only instance where a lower head in this situation would need to be yellow would be if the next signal was red-over-red, and in this case that was covered by yellow-over-dark. I thought that this practice probably ended sometime in the 80s or 90s when these signals were changed to these, with full size lower targets. Who can confirm this change and what do you know about whether all the various intermediate signals showed similar aspects or were there esoteric differences? Any plan on replicating some of the double-blocked yellows or double blocked reds? Also as info if a northound heading towards Walong is lined into the siding it would have an approach diverging (yellow over yellow) at the intermediate at 352.57 and that would be followed by a yellow signal at the north end of Marcel heading northbound. At North Walong itself the northbound signals could only show red or green (no yellow). Due to grades, short spacing of signals, train braking, etc. 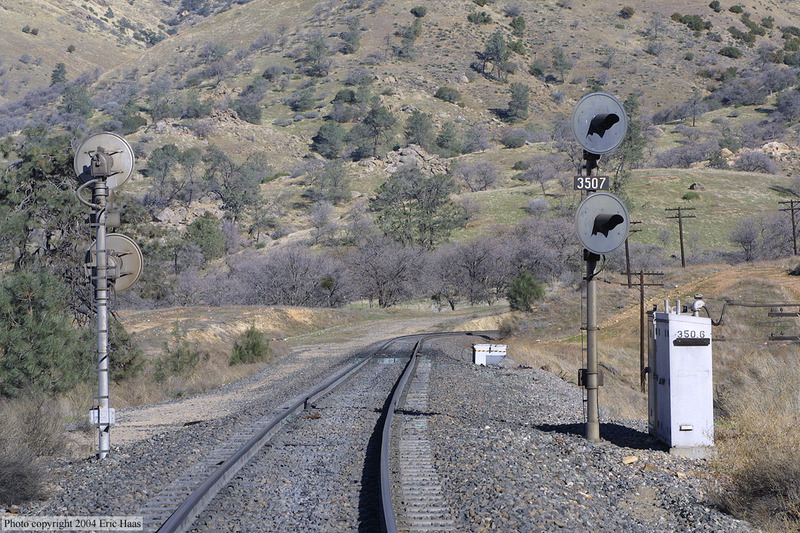 Tehachapi Pass had all sorts of signal nuances, including the repeater signals in some of the sidings for downhill moves. First item: tell me more about these double-blocked signals. Second item: Did you mean "followed by a red-over-yellow signal at the south end of Walong? (i.e. here) And if by chance the signal at the north end of Walong (the bridge) were already green, would this signal show red-over-green, or is the least restrictive aspect yellow? Would it ever be flashing yellow? I can't confirm the dates that the signals were changed but even though the bottom head (in the "newer" installations) looks like a searchlight it only had a single bulb in there that was either lit or not lit and then had the lense for the appropriate aspect. Regarding Yellow/Green approach aspects, again I don't know dates but from what I do know (talking with an old SP Signal engineer that I used to work with) when they changed the approach aspects for a diverging move from yellow-green to yellow-yellow I believe that they changed them all about the same time and there were quite a few trainman complaints from what I was told. I am not too familiar with what the SP operating rules were at the time that this was changed so I am unsure how it would have affected train handling by engineers. The SP rulebook that I have (1994) shows a Y/Y and Y/G having the same meaning but it's possible that a previous rulebook had something different for each aspect (?). To put it simply when the previous system (previous being as opposed to the current, solid-state applications with color light signals) was installed the braking charts for trains used at the time would have been for shorter, lighter trains that would have had an easier time stopping than today's trains that might rate 143TPOB or 158TPOB (TPOB = tons per operative brake), therefore the signal system allowed for shorter trains with less restrictive aspects. Once heavier trains started running some changes were made to accomodate for longer stopping distances and that included double-blocking aspects in some areas; primarily for downhill movement. For northbounds if South Bealville was red, the intermediate at MP 341.3 would have been yellow, and the northbound signal at North Cliff would have been yellow. If South Bealville was cleared for a move on the main then the intermediate at MP 341.3 would be green as would the northbound signal at North Cliff. If the intermediate at MP 341.3 was red for a northbound move then the northbound signal at North Cliff was red. If South Woodford was at red (northbound) the intermediate at MP 350.66 would be yellow and North Walong would be green. If the intermediate at 350.66 was red then so would North Walong be red. If South Wooford had a route cleared on the main then the intermediate at 350.66 and North Walong would be green. There may have been other instances as well, but those are the ones that I am aware of without further research. Yes, it would be a red over yellow (my mistake). From what I have seen and from ChrisKlas's info it seems like there weren't any red over green moves into the sidings on Tehachapi (not saying that with 100% certainty but with a reasonable amount of confidence). Regarding flashing aspects I really haven't seen much of anything showing flashing aspects on Tehachapi pass (at least the north slope); not saying that there couldn't have been but if there were they were few and far between. My observation of Y/G on that approach signal for Walong is circa 1978, for a point of reference. As to flashing yellow... confirming what Nick said, I don't recall ever seeing a flashing yellow anything, anywhere between Mojave and Bakersfield. Not that it couldn't or didn't happen, I just never saw one*, and that newfangled CTC stuff was out of our territory and I was sternly admonished to keep my mitts out of the cabinets. There were a couple of signals wired for FY in the strictly ABS territory through the AV, but definitely not all. IIRC, the w/b approach to Oban (a manual siding then) displayed FY, but the signals closer to Lancaster definitely did not. If I ever asked Earl (Whitney, my supervisor) about the difference, I'm pretty sure the answer would've been "I dunno, that's the way they set it up. We just fix 'em." * - Maybe the signal bridge north of Mojave had a FY for westbounds back when it was directional running. But a FY would be somewhat pointless because it had a (G) placard, anyway. Mike, if you don't mind my asking did you used to be a maintainer in this area? I apprenticed, very briefly, mostly marking time waiting for another job to open outside of Signals. Didn't get much past walking the track for broken bonds and replacing relays under Earl's close scrutiny in grade crossing cabinets. Our territory was up to but not including the south Mojave interlocker and down to about Acton. Thanks for the info, guys. Neat stuff! From Tehachapi southward and Caliente northward, where track speeds were higher, flashing yellows were very commonplace (at least from about 2003 onwards, which is when I started foaming with some regularity out there). Of course, flashing yellows are everywhere now, and it seems that most, if not all, of the double blocking has gone away with the elimination of the vast majority of intermediate signals between sidings and control points in single track territory. I used think that SP did some kind of 'signal upgrade program' sometime in the early 80's, but the more I'm checking photos and reading your descriptions of all the ad-hoc implementations, the more I'm thinking that changes were much more piecemeal (until 2012, that is). For example, from photos I know that the facing point (southbound) signal at north Walong was modified sometime between 1980 and 1986, with the lower head raised on the pole. But the small lower targets on the intermediate signals (3507) weren't changed to the full size targets until sometime between 1990 and 1995. All educated speculation, but you can see it makes for a nice story! And for all I know it stayed that way at least as late as 1990. Interestingly, only the southbound signal (for going towards Walong) had the lower small target in 1973. I assume this changed when they lengthened the south end of the Woodford siding in 1975. I'm curious if this means there was once another set of intermediates between closer to Woodford (otherwise why the inconsistency? ), but I have no direct evidence of that, and am learning not to try to apply too much logic when trying to figure what SP would have done. Thanks for the train orders link! It's interesting that the guy who started that thread didn't mention this signal. Is this also the repeater signal that your modeling in the video you posted to your own thread? Sorry about that! I'm modeling spring of 1994. The mountains will be lush with green and there was so much cool motive power: brand new ATSF warbonnets, older bluebonnets, cowl units ... and on the SP side, the Dash 9s and SD70s had just started to show up, but there were still plenty of tunnel motors and older power running around too. I only wish I could have experienced that period firsthand! The reason the guy didn't mention that signal is because he was speaking from the perspective of an uphill train, and these three repeater signals were only for downhill trains in three sidings (Bealville [before the crossover], Cliff and Woodford). They were installed in 3 areas where downhill trains couldn't see the absolutes at the end of the siding (or in the case of Bealville, again, the crossover) until they were almost on top of them - essentially as a heads up to the crew as to what to expect at the control point just around the blind corner. If a train was coming up to the end of the siding and the signal was red, these "advanced" signals would show a flashing red (restricting) indication. I'm not sure why the signal department chose flashing red instead of lunar, but they did. 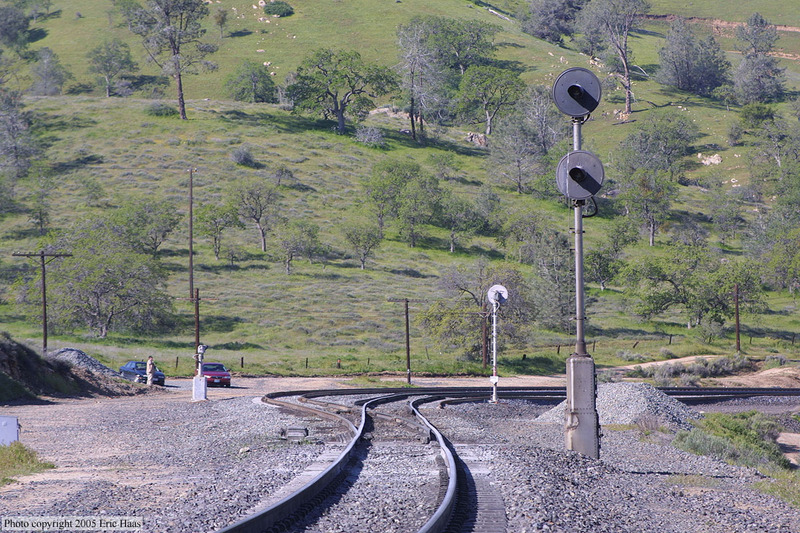 If a train had a signal out the end of the siding back onto single track, these three signals would show a clear. The picture you linked is indeed the signal in my video though, as I mentioned elsewhere, I don't have the Bealville crossover on my layout so I had to compromise and put it a few hundred yards short of West Bealville instead. I also only have two of the three on my layout because, as I also mentioned previously, Woodford and Cliff are combined into a single siding on my pike with one end representing E Woodford at the 5th crossing of Tehachapi Creek and the other end representing W Cliff, just entering tunnel 5. The downhill end of the siding is Cliff, of course, so the signal I installed is considered to be 3423 (which is highly important since the signal heads were mounted on opposite sides of the pole on 3423 and 3483... lol). Just like the electric time locks I posted in the other video, these unique little signals serve no real purpose on an N scale layout, where a downhill train can stop in 2 scale feet if necessary, other than to look nice and add some eye candy. Another factoid of which you may be aware: The control points were always designated East/West [Siding Name] until they were renamed after the UP merger. As anyone who's researched the SP knows, every line, even the I-5 corridor running 700 miles almost due north from Stockton up to Portland, ran east/west - because, in the Southern Pacific's eyes, all roads led to San Francisco. I've posted a new thread on TO asking if any of the Tehachapi guys on there know exactly when the Approach Diverging aspect was changed from yellow/green to double yellows. No replies so far, but it's pretty late, so hopefully someone will chime in tomorrow. You story about the trainman complaints seems logical, probably pretty close to reality I would think. The term "piecemeal" is probably the perfect way to describe the SP signal upgrade philosophy. I do know that in the early 90s(?) the SP did upgrade from Ilmon to Caliente. Searchlights were used but they utilized new solid-state equipment to control them. Elsewhere (a little outside of Tehachapi) I can remember seeing an area on the Fresno sub (around Delfar/Earlimart/Tipton) where within a 20 mile stretch you had searchlights, colorlights (vertical) and the "owl head" colorlights; using a combination of solid state processors and old relay logic; using pole-line, electrocode on the track, and electrocode over poleline with track relays, and half of the locations having flashing yellows and the other half having no flashers. What was where obviously varied between each location. In a conversation I had with someone from the SP signal engineering department many, many moons ago he said that they just had a shoe-string budget as far as upgrading anything went. To put it bluntly they really had some skilled signal guys in keeping their system going as long as they did with all the band-aid fixes that were done. That being said, UP has been paying for SP's lack of signal upgrades recently with the PTC mandate if you notice how many former SP lines that have/had searchlights have been upgraded in the past half dozen years or so. There are actually a few spots still with double-blocked aspects even with the new upgrades, but instead or sequential reds, or sequential yellows it is double block flashing yellows. Heading northbound at North Bealville is one such location: if heading northbound and North Bealville shows a FY on the main it will also show an FY at Bealville XO for a northbound move. The removal of many of the intermediates eliminated a lot of the short braking blocks and for the most part allowed us to use the standard R-Y-FY-G aspect progression. Because of that though many control points now also display a Y/Y aspect on the trailing signals in case a train is going in the hole at the next control point down the line and there are no intermediates between them. I am kinda guessing/speculating here but when the SP installed them instead of using a bunch of relays to allow a signal to be green or lunar (or red?) they kept the circuits simple by using a "FR-2" flashing regulator that just required a single input to indicate the signal was lined or not. Not to mention that a searchlight mechanism with green and lunar lenses would likely have been a non-stock part. I remember when we were doing the engineering for Bealville (which was the first on the north slope to get upgraded in the UP era) it needed to be clarified with the operating department as to whether or not those little repeater signals could be removed. But now if going in the hole at South Bealville on a northbound move if the signal is R/Y you would know that you are stopping at the Bealville XO whereas if the signal is R/FY (diverging advance approach) a train would know that they are lined at least through the Bealville XO. Once reaching the Bealville XO they would see a yellow telling them to stop at North Bealville, or another Flashing Yellow indicating that they are lined out of North Bealville onto the single track. I am kinda guessing/speculating here but when the SP installed them instead of using a bunch of relays to allow a signal to be green or lunar (or red?) they kept the circuits simple by using a "FR-2" flashing regulator that just required a single input to indicate the signal was lined or not. Not to mention that a searchlight mechanism with green and lunar lenses would likely have been a non-stock part. You're absolutely right, and that makes perfect sense. I forgot that these things had to have the capability to display red anyway, so FR instead of lunar would have been much easier. GCOR was adopted by SP and ATSF in July of 1985. That is when SP officially changed to yellow/yellow for Approach Diverging. But General Orders allowed for the reality of the time it took to actually swap out the color roundels. To answer the question, a model set in the 1990s would be yellow/yellow. So I guess that answers that! That certainly wouldn't have been an impediment to some of the weird stuff I ran across. Right up there on the "weird" scale were the SA pot signals in and around the engine service area at Taylor Yard. They had blue and orange roundels. Never used on UP to my knowledge, but I'm certainly going to use the idea on my layout, if only for the WTF? factor.